That’s the verdict of Blues writer Will Rooney, who was speaking in the News’ latest edition of Pompey Talk (see attached video). Kenny Jackett’s side travel to Loftus Road tonight for their fourth-round replay, after drawing the initial game 1-1. Since that stalemate at Fratton Park, Pompey have suffered a midweek defeat at Luton and were held to a draw against Doncaster Rovers on Saturday. 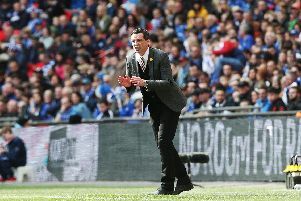 Those results combined have helped see the Blues drop out of League One’s automatic promotion places, with pressure also growing among teams competing for a play-off place. With six new additions also added to the squad in recent weeks, and five heading out the exit door, there’s a school of thought that Jackett & Co would be best concentrating on their league aspirations and getting the new arrivals integrated into their way of thinking as soon as possible. A point reinforced by the fact that of the six new boys, only Bryn Morris can feature against the R’s tonight. Yet speaking in the latest edition of Pompey Talk, Rooney believes the game provides another opportunity for the players to regain some much-needed form and confidence as quickly as possible. He said: 'It's annoying (having the QPR game), as the new lads can't feature and couldn't really be in the plans in training. They can't really work on things if Jackett can’t get them into the side (for this game). 'But, you know, footballers like to play games at the end of the day, they don't really like to be on a training pitch - they'd rather have a busy schedule. Pompey go into tonight’s game with one win in six – and that came in the Checkatrade Trophy against Peterborough. As mentioned, their form has seen the Blues lose their grip on the League One title race. But Rooney believes there’s no need to press the panic button just yet. 'Every side has their lull spells, no matter who they are,’ he added. 'You look at Man City, before Arsenal, I think I read they had lost as many games as they had for the whole of last season in a nine-match spell, so I think every team can have times like that. 'Now Jackett's got new recruits in, maybe he can vary it up, maybe the lads like (Ronan) Curtis and (Jamal) Lowe just need a breather. 'Jackett, at this latest press conference, seemed to lean to that. 'They need a breather at some stage and haven't offered the same attacking threat as they did in the first half of the season when they were at their scintillating best.